Fill your Kilner jars with sweeties: the more colourful, the better. Draw bat wings in pairs on your black paper. Cut out the wings and stick a pair on each Kilner jar. Arrange the LEDs at the bottom of the bucket, loosely scrunch some torn-up newspapers and arrange around the LEDs inside the bucket to pad it out, leaving some space at the top for the sweets. Cover the top with a sheet of baking parchment to stop the sweets from falling through. 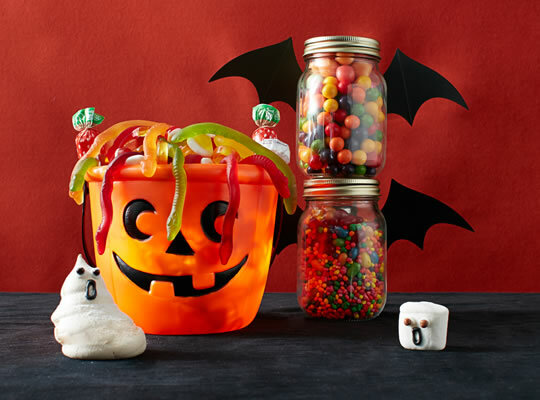 Arrange the sweets on top in a heap (the jelly snakes look great draped over the top like gruesome hair). Make up the jelly to pack instructions and stir in a few drops of red food colouring. Using your edible food colouring pen, draw large dots on some Mint Imperials to make the eyeballs. Pop a few ‘eyeballs’ into each glass and pour over the jelly. Chill until set. Easy. Have a scarily good Saturday everyone, and don’t forget to grab a Dead Good Deal or two while they last. This entry was posted in Talking Ocado and tagged decorations, Halloween, Halloween ideas by Ocado. Bookmark the permalink.